Will your brother wait for your Rakhi this year? The bond of a sister and a brother is so pure, so tender and so beautiful. As children, boys who have no sisters yearn for someone who would tie rakhi on their empty wrists while girls with no brothers pray for someone to whom they can tie a Rakhi. But as we grow up, the bonds loosen up. We get so engrossed in work, marital duties, and raising kids that we neglect to stoke the stove of family relationships to keep it warm. Consequently, the warmth cools down with time and we grow distant from ones we love the most. 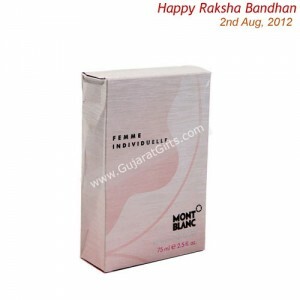 Festivals like Raksha Bandhan are like reminders to us to keep the fire burning. It is an occasion to take out sometime to visit our past and make special efforts to keep the bonds strong and unbreakable. Online Rakhiorders might seem like impersonal to you but they offer you an easy way of expressing that even though you may be across seven oceans, your heart is always near your brother and his family. Leaving your hometown and moving to another city or country does not mean that you have to leave behind all those who you love too. You can always carry them in your heart. Just let them know that you are thinking about them from time to time. When you send rakhi to India, you are telling your brother that you pray for his well-being and long life and the special rakhi you send for your bhabhi tells her that you love and respect her too and accept her as inseparable from your brother. 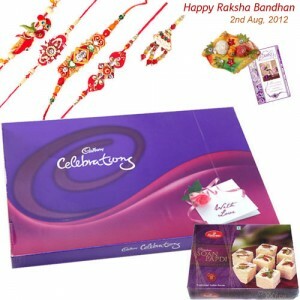 So book your Rakhi order now at Gujarat Gifts and gift a smile to your brother this year! Do you know that Raksha Bandhan (Bond of Protection) is perhaps the only festival of its kind in the world to celebrate the love of brother and sister? When sisters send rakhi to India, it means that they are offering prayers for the happiness, prosperity, and long life of their brothers and their families. A brother, who proudly sports rakhis on his wrists, glows with the pride and love for his sisters. A Rakhi to India is a symbol of the love of a sister and a commitment of a brother to protect her sister and her happiness at all costs. Sandalwood (chandan) rakhis that come with their delightful fragrance. Sandalwood is considered sacred and is a favourite of Lord Vishnu. 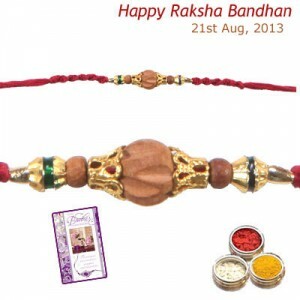 Sandalwood rakhis may contain small sandalwood beads, trinkets or shavings. Rudraksha rakhis may have one or more rudraksha beads in the centre. A favourite of Lord Shiva, a wrinkled rudraksha bead is said to attract good health and fortune and ward off evil and bad luck. Mauli Rakhis are simple, traditional and comfortable to wear. Mauli strands are often tied on the wrists when one performs a puja and it is considered auspicious for the wearer. Lumba rakhis are beautiful. Originally, they come from Rajasthan and are tied on the wrists of sister-in-laws (bhabhis). In a religion that considers wife to be the other half of the husband, it cannot be enough for a sister to just pray for the protection of his brother. Thus, Lumba rakhis wish all the good health and fortune for the bhabhis too. 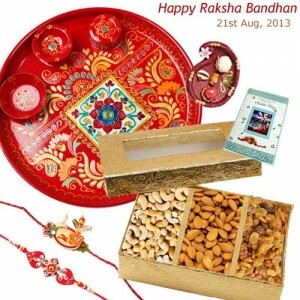 Explore the website to discover more than 1,000 types of rakhis at Gujarat Gifts. 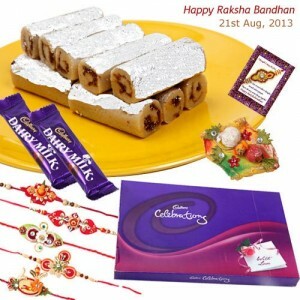 How to communicate through Gifts for Rakhi 2013? What is more sacred than the chaste relationship of a brother and a sister! Growing up together, they fight and cry, care and adore, stand up for each other and get each other into problems, look for their own space and look out for each other – brothers and sisters are inseparable. Gujarat Gifts nderstands these emotions quite well and hence, has come up with gift options that help you communicate them well to your brother and sister in India. A cosmetic kit just perfect for a sister or a brother who hogs the mirror all the time. While the cosmetic Rakhi packages at Gujarat Gifts are all branded, you can add the fun element by saying, “Let the magic of these beauty products work on you, witch!” Do find some good places to hide when you meet your sister next time. On a more serious note, these cosmetics are high-quality products and will actually help your sister glow. Only you know what works best for you. If you are having doubts about what or how to send Gifts for Rakhi to India, you can email id at info@gujaratgifts.com for a prompt and free gift consultancy. Gentleman’s Hamper: If your brother is a professor or at a reputable designation or seems like a perfect gentleman at all times, the Gentleman’s hamper will be a perfect gift for him. The hamper includes five Ferrero Rocher chocolates, two Parker pens to grace his desk, and two rakhis. Auspicious Car Stands: Om Ganesha car stand and Balaji car stand available at Gujarat Gifts are gold-plated and decorated with American diamonds. They are just perfect for brothers who have bought new cars. Hopefully, your prayers and the divine blessings of the deities will always keep your brother and his family safe while traveling. Gifts that evoke blessings of Goddess Lakshmi: Businessmen and dealers instantly fall in love with anything that grants them wealth and prosperity. So, if your brother is one, you can choose to send Luck & Delight gift hamper, Tremendous Delight gift hamper, and Exclusive Rakhi Hamper as online gifts for Rakhi to India. These hampers include yantras that evoke the pleasure of Lakshmi ji – the goddess of wealth and prosperity. Gift for metro sexual bro: If your brother is too much into good looks and grooming, is a teenager, or a metro sexual, you can send him Complete rakhi gift hamper. It includes Lakme Total Care pack and a pen stand. Perfect Hamper for all brothers: Sometimes it is difficult to decide what gift would be suitable for your brother. In such a case, such Raksha Bandhan Gifts to India are perfect answers to your dilemmas. Ganesha and Lakshmi idols represent good fortune and wisdom for your brother and the assorted dry fruit pack has an ethnic appeal that continues to charm Indians. All these Rakhi gifts include fancy rakhis, a free greeting card, and a free handcrafted tikka for your brother with roli, chaawal, and an auspicious kodi. Choose comfortable cottons to send as Rakhi gifts to India, if you want to gift salwar suits or kurtis to your sister. This is the monsoon season in India and at most places, it is hot and humid. There is nothing like cotton to keep you cool. We have extensive collection of some trendy cotton kurtis for college-going students as well as smart designer salwar suits for sharp professional women. 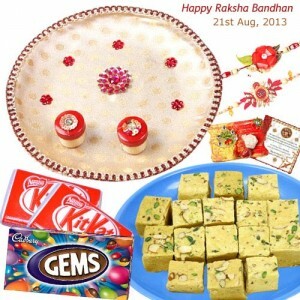 If you want to sending Rakhi Gifts to India, there is nothing like the traditional pendant set. The red and green combination in golden settings makes it a perfect match with just about any dress. With the string of festivals starting now, your sister will certainly love to flaunt it. Choose a feminine fragrance for your sister to make her feel special all day. Perfumes, fragrances, and aromas form an intrinsic part of Indian culture. Soft floral fragrances are some of the most sought after these days. Induction plates and handi-shaped cookers and utensils used to cook and serve are some of our fastest moving gift items. Gujarat Gifts only offers most prestigious brands in the market like Prestige, Philips, Bajaj, and Milton. 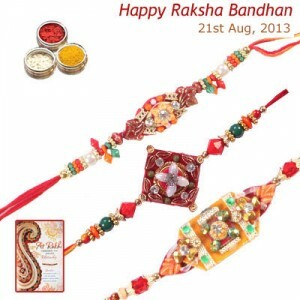 They make wonderful Online Gifts to Indiafor Rakhi. Online Rakhi to India is a boon for forgetful Einsteins! We have become so caught up with the constant hum-drum of our daily routine lives that we forget to take out time for things that really matter. Especially if we live abroad, we find it difficult to keep track of all the Indian festivals. Our colleagues, fellow students, and friends hardly understand the multiplicity of festivals, celebrations, and auspicious occasions that we have. NRI meets, where all the Indians gather to celebrate a particular occasion, are rare. 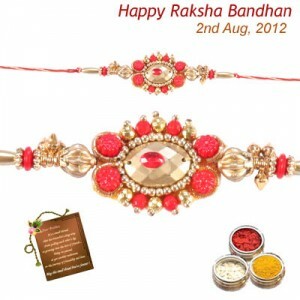 Raksha Bandhan is one of the festivals that is not so well-known outside India. While Westerns are well aware of Holi – the festival of colours and Diwali – the festival of lights, they hardly know anything about Raksha Bandhan – the festival of brothers and sisters. 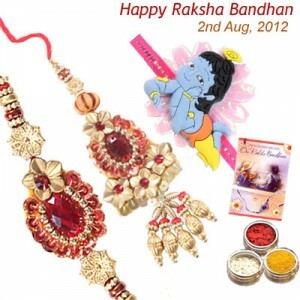 So, if it has slipped your mind until now, please note that the festival of Rakhi is on 2nd August, 2012. 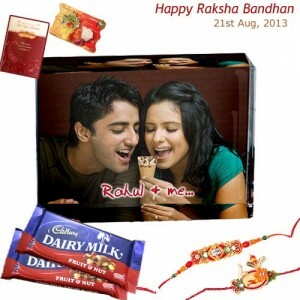 This is the time to order Online Rakhi to Indiaif you want to get it delivered on time. As we all know, efficiency is not always the forte of our country. Along with systemic delays, there are certain intangible factor like uncertain monsoon conditions and broken roads that one needs to keep in mind. Gujarat Gifts has developed an efficient system to deliver your Rakhis to India on time, with minimum strain on your pocket. This India-based online gift portal offers extensive collection of online Rakhis to India as well as some of the exclusive Rakhi Gifts to Indiaonline to send along with them. That you forgot to order them until the last minute – well, that will remain a secret between us…shhhh! 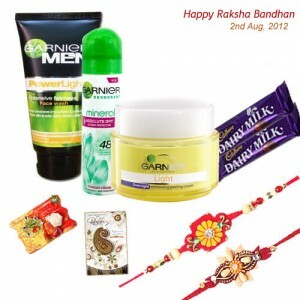 Are you still looking for affordable Rakhi Gifts that your sister will like? Gujarat Gifts offers a delightful range of online Rakhi gifts to India that has been handpicked by experienced category managers who keep a regular eye on the latest trends in the market. There are smart sturdy handbags with a lot of pockets for fashionable college students or organized professional women who like to put their home in their purses. Then, there are cool, comfortable and trendy cotton salwar suits as well as party-purpose silk salwar suits for the North Indian gals who love to dress up every time they step outside their homes. Married sisters, especially those from South, would love the range of silk sarees available online with Benarasi border and pallu. 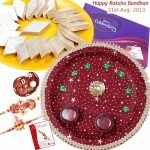 I haven’t forgotten about the Send Rakhi Gifts to Indiabeing ‘affordable’. While a doll or a cuddly teddy can instantly brighten the day for a kid sister, a grown-up sister would need something that is either more suitable to the occasion or more practical for her. You can try sending customized picture frames, clocks, and beautiful cushions with your and your sister’s childhood photographs along with a funny message to go along with it. 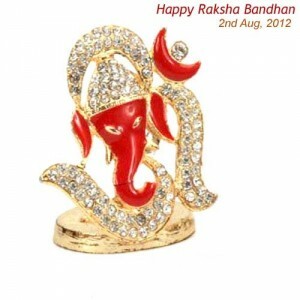 Rakshabandhan is just round the corner…on 2nd August, 2012. Most online shopping sites that allow you to send Gifts to India take anywhere between 15 to 20 days to deliver the gifts. Gujarat Gifts does have the shortest delivery time for Rakhi to India – two to three days for major cities in India where gifts can be delivered through Blue Dart courier services and about five to six days for remote locations, only within the reach of Indian Speed Post service. Yet, if you want to make sure that your brother does not have an unadorned wrist on the auspicious day, this is the time to send Rakhi to India. This is the monsoon season in India – highly unpredictable in most parts of India. Landslides, incessant rains, pot holes and traffic jams are just some of the reasons that make it difficult to rush to a destination. The team at Gujarat Gifts is dedicated to keeping our customers happy and satisfied and yet, it is always a good idea to have more time at hand to Send Rakhis to Indiato keep our targets simple and achievable. 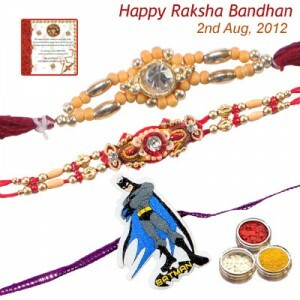 Moreover, our Rakhi collection is one of our hottest sections right now. We do keep adding new products to it but it might get depleted, if you wait till the eleventh hour! Please note that while Rakhi sweets, flowers, and cakes are delivered fresh on the same day of your order in about 500 cities in India, delivery of Rakhis and other Rakhi Gifts to India may take time, depending on the reachability of the destination. A smart metro sexual brother would love one of the personal grooming kits for him, which may include shampoo and conditioner for men, moisturizer, shaving gel, hair styling gel, razor, deodorant, and even a Fair & Handsome cream. Put all that in a leather pouch that he can easy carry while travelling and you will surely win him over with your Rakhi gift. Brothers who are collectors at heart will love Unique Rakhi Gifts to Indialike silver pens, 3D crystals with laser-engraved photos of your brother and his family, and beautiful idols and showpieces that he can put on display. For real couch potatoes, buy personalized pillows and cushions with childhood photos of you and your brother and some playful messages to go along with them. Or you can gift your brother a customized clock with a schedule to wake him up and encourage him to follow a routine and a mug with happy photos to bring the sparkle in his eyes. Besides, there are belts, watches and office accessories that all men can use. For kid brothers, there are school gear, video games, Hot wheel cars, and board games to choose from. 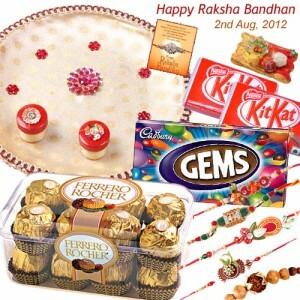 Last but not the least, any Sending Gifts to India on Rakhi for brother will do as long as you send it with love. 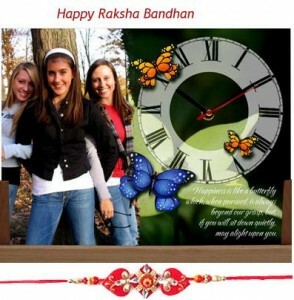 Every Raksha Bandhan, you fret about sending Rakhi gifts to India for your sister. The only challenge is that she is miles away from you and Rakhi gifts for sisters available online are just too expensive. So, you phone her on her special day and promise her to bring a lovely gift next time you fly home. Assort a Rakhi special gift hamper: Flowers, by themselves, are sweet but try including a box of chocolates or a teddy along with it and you may have a perfect combo for your sister. You may also throw in a video game for your nephew and a doll for your niece, and gift their beaming faces to your sister. Research about what your sister needs or her preferences: A kitchen appliance for a sister who hates kitchen will surely be a super-flop Rakhi Gifts idea. A key chain, pen, or handbag with your family photos or the photos of your sister’s favorite rock star can be a cute functional accessory she can easily carry everywhere. It will also add to her style statement. Personalize gifts: A 3D crystal cube with a laser-engraved photo of your and your sister’s childhood moments together can be used as paper-weight on your sister’s study table or can be put on display in the drawing room. A pen with your sister’s name and photo on it can be a cheap Gifts for Rakhi to India which shows how much you love her. 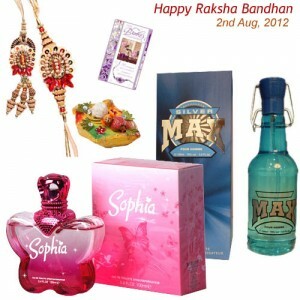 Gujarat Gifts, you will find excellent Rakhi gifts for sisters online. Just go to different categories and order ones you like.